Sunday October 30 4-6 pm- Western Dressage Lessons with Patti Gruber. ​Sunday November 13 - Western patttern work lesson at Silver Spurs in Woodstock, most likely in the late morning, early afternoon. Jenny does have a few lesson horses available if you would like to ride one of hers. Monday November 21, 6:30pm we will be going to a working equitation clinic at Karmik Acres in woodstock. This is a demo clinic they are doing for us, so no need to bring a horse. Please let me know if you are interested in coming to this clinic so I can give her a head count. This clinic is open to english riders as well so if you know any other members that might be interested, have them contact me. outside of Pony Club. Horsemasters are welcome at all western activities. Turnout and Tack Western breeds and colors, Western bits, bridles and saddles. Western attire. Showmanship Horse handling on the ground. Moving the horse, backing, proper leading, beginning halter showing and showmanship patterns. Horsemanship Proper use of natural and artificial aids (hands, seat, legs, whip and spurs). Proper position of head, shoulders, chest, elbows, hands, seat, and legs. Cues for gaits (walk, jog, lope, hand gallop, square halt). Also includes neck reining, lead awareness and patterns. Trail Understanding sidepass, counterbend and reinback. 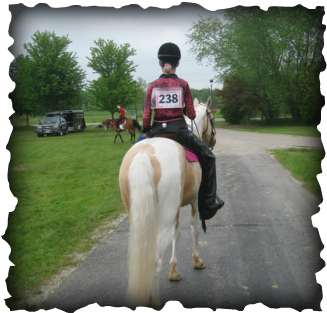 Riding over obstacles, opening gates, backing through poles/barrels, going through water and over bridges. Beginning patterns. Reining Working lope departures, circles, collection, lead changes, reinbacks, pivots, spins, rollbacks and sliding stops. Practice riding patterns. Show Etiquette How to perform at a show including tack, attire, show bills, and manners. Learn about the variety of western events (timed and untimed) and basic patterns.